Blackheath was so called because it appeared a darker colour than the green fields beside the Thames which it overlooked - the soil was dark and so were the plants which grew there. The name has nothing to do with the plague or Black Death. The soil was poor and was not cultivated, but chalk, gravel and larger pebbles for ballast were dug out of it. This left deep pits all over the Heath. Some are now ponds, some were filled in with rubble from bomb sites in the Second World War. In both the Peasants’ Revolt of 1381 and Jack Cade’s rebellion of 1450, the rebels camped on the Heath (a convenient high point overlooking London). The Cornish rebellion of 1497 was defeated in a battle on Blackheath. The Heath was a lonely place where travellers along the London to Dover road (now the A2) were in danger from highwaymen. But it was also a place for recreation. Fairs were (and are) held here, and many sports played. In recent years it has been the starting point for the London Marathon. The Heath became a public open space in 1871, and is now administered by Lewisham and Greenwich Councils as it falls within both Boroughs. 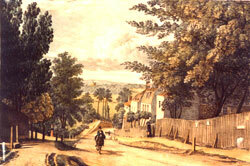 The district around the Heath began its career as one of London’s most wealthy suburbs late in the seventeenth century, when houses began to appear around the north-western corner of Greenwich Park, and Lord Dartmouth enclosed some land on the western edge of the common and built the fine street that he called Dartmouth Row. To the east of the park Sir John Vanbrugh built a village of large houses for his family between 1717 and his death in 1726. 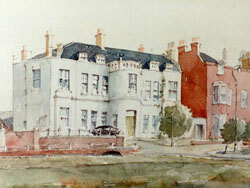 The trustees of Morden College, the Blackheath almshouses, were the most active landlords in the middle of the century. They initiated development at West Grove from the 1730s, and at Grote’s Buildings from the 1760s. Elsewhere on the south side substantial building did not begin until the 1790s, but then it came with a rush as John Cator and Lord Eliot covered most of the heath frontage before 1805, and the Village began to grow into a major shopping centre. 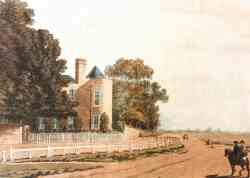 The early decades of the 19th century saw major developments on the Cator Estate to the south-east of the Heath, and on the Earl of St Germans' land to the east. 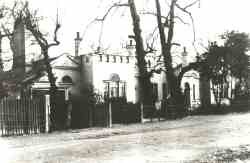 All the houses described above were substantial ones intended for the upper and middle classes, but now the growing community needed substantial numbers of servants and service workers to sustain it, and so a number of working class enclaves began to appear, tidily hidden away in mews and courts behind the main Village streets, or in the large disused gravel pit known as Blackheath Vale. Later 19th century development followed similar lines, with large houses for the middle classes speading out in all directions from the Heath until they merged with Greenwich to the north, Kidbrooke to the east, and Lee and Lewisham to the south.